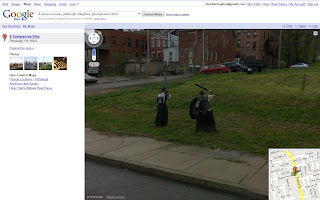 One of the funniest things on the net is Google Street View. I love the amount of people who have been caught, seemingly unaware, while in the middle of some activity that is either unlawful or out-and-out embarrassing! I'm not entirely sure what's happening at '8 sampsonia way, pittsburgh, allegheny, pennsylvania 15212' but something tells me these guys don't have a lot of friends. But some people do these things on purpose. This one looks posed. I reckon you're right Will, if I saw the Google Van rolling down the street I'd be likely to moon it, or at the very least pretend to break into a building. Nick, I reckon one of those guys is the kid out of Role Models!